On a Sephora trip I picked this up, it was next to the counter in one of those end cap displays stores set up to get you buy last minute items. Yes I am one of those who falls for those on occasion. 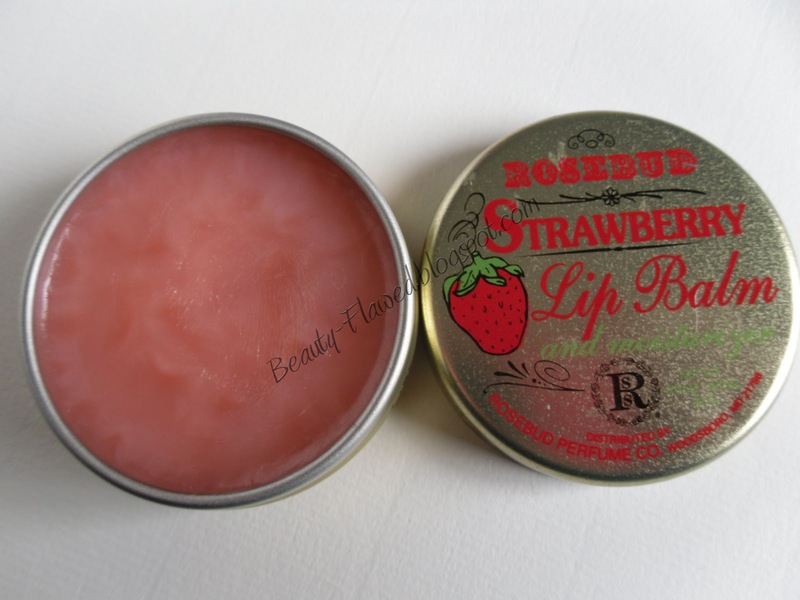 This is by a company called Rosebud Perfume Co. who makes a few different lip products that can be used on the skin as well. Strangely they do not make any perfume products. I like this little lip balm its different, the tin is what really caught my eye. It smells just like fresh strawberry and when applied is silky on the lips. This is not sticky, tacky, or greasy like other balm products in tins can be. It is supposed to have a strawberry flavor as well but I don't think it really tastes like anything. It does a good job of moisturizing lips as long as your applying it regularly and has a little bit of a pink tint but nothing really noticeable. I like to put it under lipstick to make sure my lips don't dry out because it is not glossy you can get away with doing this just fine. I like to keep this at my desk for throughout the day use, I had it in my purse for a bit but it got sweaty and started to melt a little so I would keep it out of hot places. I like that it has a simple ingredient list so you pretty much know whats going on your lips. This was an impulse buy and I'm not sure I would splurge again ($7 at Sephora). I like it but the furture could go either way with this product.